The set includes a Wii Remote Rapid Charging Cradle, Wii Remote Rechargeable Battery Pack with integrated Battery Cover, Wii Remote Jacket, Wii Remote Wrist Strap, and A/C Adapter. 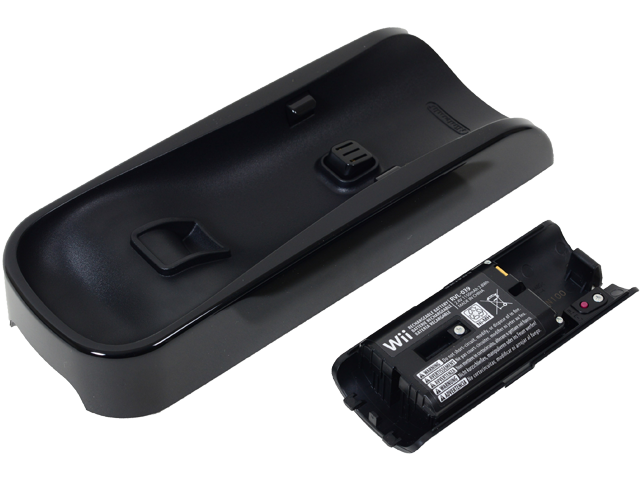 The Wii Remote Rapid Charging Cradle and Rechargeable Battery are available only in BLACK. Note: Due to shipping restrictions, lithium ion batteries can be sent via Standard Shipping ONLY. Only one (Canada) or two (US) lithium ion batteries can be accepted per order. *Recharging times and play times are approximate.